Scrubbers are an important part of a clean and safe workplace. These machines remove debris, slippery materials, and dirt from floor surfaces. Scrubbers remove dirt and stains, but they can also remove debris posing a slip or trip hazard. Clean floors are not only an aesthetic matter. Slip and fall accidents are the most common workplace injury, according to the United States Occupation Safety and Health Administration (OSHA). They cause 65% of all lost workdays and account for 35% of all workplace injuries. Across the country, approximately 25,000 slip and fall injuries happen every day, costing the nation about $60 billion each year. To reduce the rate of these incidents, OSHA suggests that workplaces clean floors regularly. Using scrubbers in your workplace helps you keep your workers safer, reducing injuries and lost days at work. Scrubbers can also help you protect clients and customers – and your business. It’s not only workers who suffer injuries from unclean or dangerous floors. About 2 million people are injured due to falls caused by flooring issues each year. In some industries, clean floors are also a matter of public health. 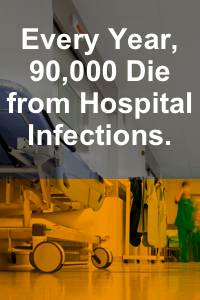 For example, 90,000 people in this country die from hospital infections every year. In hospitals, clinics, and other healthcare settings, floor scrubbers can help keep flooring surfaces clean, reducing the risk of these types of infections. Unfortunately, not all clinics and healthcare institutions have their own fleet of scrubbers, potentially leading to poor cleaning jobs. Over 50% of hospital surfaces that were supposed to be disinfected were not cleaned at all, according to one study of 200 hospitals. It’s not only hospitals who need to worry about health and hygiene. Cleanliness essential for any business, particularly restaurants, where there is a need to maintain high standards and keep floors clean to satisfy health inspectors. Day cares, childcare centers, assisted living facilities, nursing homes, and preschools may also need to meet certain standards for cleanliness. Clinics, dental offices, and laboratories need to keep their floors clean to prevent the spread of disease and offer a hygienic environment. Whether you are a healthcare-related business, a restaurant, or another industry requiring a high level of sanitation, owning your own fleet of floor scrubbers helps you exert more control over your cleaning. With floor scrubbers, your janitorial staff can keep floors pristine, ensuring health and safety for everyone. With a cleaning service, you may have to rely on the service showing up on schedule. With scrubbers, you can ensure any spills can be dealt with promptly. Without regular maintenance, your scrubbers will fail, just like any machine. They will become less efficient over time. It will take your staff longer to perform the same tasks, and the cleaning may be less effective. Regular maintenance helps prevent this and ensures your staff can clean properly, with less adjustment controls, and fewer passes over the same spot. Cleaning takes less time and your floors look better with proper maintenance. Working with a professional maintenance and repair service also ensures you receive scrubber repair services when you need them. If you need to place a call when one of your scrubbers is down, you can be sure you’ll receive fast, prompt service, getting your floors back to shape in no time. If your business has invested in walk-behind floor scrubbers, they need maintenance and repairs, too. Many people consider walk-behind floor scrubbers as requiring less maintenance, but this is not true. Walk-behind industrial level floor scrubbers need the same type of maintenance as any industrial cleaning equipment. Even if your models don’t have digital displays or some of the extra features of larger models, they still have scrubbers, brushes, and other components that can fail without proper care. The right industrial cleaning equipment service and maintenance schedule will extend the life of your walk behind-floor scrubber and will keep your warranty valid. If you don’t take care of your scrubber in accordance with the manufacturer’s recommendations, your warranty may become void — even with a new machine. You will need to pay for any repairs caused by a lack of maintenance. If you have a previously-owned scrubber, proper maintenance can keep the repairman away, letting your machines work longer without breakdowns. If your walk-behind floor scrubber breaks down, a quality industrial cleaning equipment repair service can help you get back on track faster. When you work with a company that offers maintenance support, prompt service calls may be an additional advantage. You may enjoy faster service or preferential scheduling if you need repairs. Eventually, every component in your scrubbers will wear down and may stop functioning. Regular maintenance helps individual parts work their best for the longest possible time. You get more use and a longer life out of your machine with proper care. Whether you buy a new or used scrubber, it will last longer with the proper care. The second part of properly maintaining your industrial cleaning machines is knowing who to call when you need commercial cleaning equipment repair. Even with proper maintenance, your machines can break down. Debris can get into the brushes, making them less efficient. Gravel, rocks, pieces of glass, and other debris can cause damage to the squeegees or other components, making repairs necessary. Knowing who to call and calling quickly means someone can arrive at your business with minimal time passing by. Why Hire Regular Maintenance And Repair Professionals? You get a better return on your investment. You’ve probably spent considerable time hiring, training, and screening your maintenance and cleaning staff. In addition, you may have spent a considerable investment in buying your fleet of industrial cleaning machines. To get the best return on your investment, make sure your cleaning staff is as efficient as possible and your machines last as long as possible. A regular cleaning and repair service can do both.With properly maintained vehicles, your staff spends less time cleaning because they do the job right the first time, saving you money. In addition, regular maintenance keeps your machines running smoothly for longer, potentially with more time in between repairs. It costs more to repair a scrubber than to maintain it, so preventing expensive repairs is a smart use of your budget. Whether you have a new or used scrubber, you may eventually want to sell it. Regular maintenance and repair can translate to a better resale price, so you have more money to re-invest in your company or in new cleaning equipment. Showing your buyers a scrubber with an extensive paper trail of regular maintenance shows you have taken care with the equipment and helps you negotiate the price for the machines. Properly maintained scrubbers can mean less water spilled on your floors — and a lower risk of slip and fall accidents. Poorly maintained scrubbers can leave behind streaks of water or puddles of liquid behind. In some cases, they may even spill fluids. This can pose a risk for your workers and your customers. You don’t want to have slip and fall accidents occur at your workplace because of inefficient or faulty floor scrubbers. Scrubbers are supposed to make your business safer, not more dangerous. You can protect yourself from accidents and injuries. If someone slips and falls in your workplace because you have not properly maintained your cleaning equipment, you could be open to a legal claim. Regularly scheduled maintenance and the paperwork to show for it can help prove you’re serious about safety in the workplace, which can help you avoid lawsuits. You may spend less on cleaning. If your scrubber isn’t working correctly, especially because the brushes or squeegees aren’t working right, your staff must clean the same spot again and again, extending cleaning time and the amount of money you need to pay for cleaning. In some cases, your staff may spot clean with additional product because a scrubber doesn’t work correctly. With a properly working and properly maintained scrubber, more stains and dirt come off the floors, meaning less specialized care for your floors and less expensive cleaning. You may enjoy a better business image. Customers don’t want to walk into your business and see dirty streaks of water or debris on the floor. Floor scrubbers are designed to help you avoid this problem, but they only work if they are in proper shape. Scrubbers that leave behind streaks or dirty water can create a poor impression of your company. Sparkling floors show that you’re serious about details and about treating customers well. Taking care of your floor scrubbers can extend their life, makes good business sense, and helps to create the best workplace possible. But how can you make sure you hire the right organization for your maintenance and repair needs? Where can you find a company meeting all these requirements? For more than 40 years, companies have been trusting Bortek Industries with their industrial cleaning machine repair and maintenance needs. Bortek Industries has built its entire business model around industrial level cleaning machines. We sell scrubbers, sweepers, and other machines for outdoor and indoor use. We also repair and refurbish them, in some cases rebuilding machines from the ground up. In addition, we offer personalized maintenance schedules for all major models of scrubbers and sweepers and repair services well. With our wide range of services for sweepers, street sweepers, parking lot sweepers, sweeper scrubbers, and scrubbers, we have the parts and knowledge you need to take care of your machines correctly. Our technicians are carefully chosen and extensively trained to provide the best possible service for companies just like yours. Always professional, our technicians can meet with you to develop a personalized maintenance and repair schedule based on your fleet, industry, cleaning needs, and more. We’ll develop a set of guidelines, so each of our technicians will follow the exact same maintenance schedule every time. We’ll make sure our maintenance schedule is designed to protect your fleet of cleaning machines. Our friendly and professional technicians are only part of the secret. Bortek Industries works closely with a variety of machines. We rebuild and refurbish as well as maintain and repair, and we have a wide selection of parts as well as a network of suppliers and close relationships with major manufacturers. When you need repairs completed, trust our technicians. We likely have the parts on hand. If we don’t, we can get them quickly. In each case, our goal is to help you enjoy the cleanest property possible. Our customers are often most pleased by our ability to listen. At Bortek Industries, we don’t only offer you a one-size-fits-all solution. We understand that your fleet and your business needs are different than your competitors’ fleet and requirements. We take the time to listen to you and to understand your specific needs. We’ll show up enough to keep your machines in top shape — nothing more or less. Our customers appreciate this honesty and this commitment to their needs. If you’re not sure what to do to keep your scrubbers in their best shape and condition, contact Bortek Industries for more information about a maintenance schedule. If one of your scrubbers is not functioning correctly, contact Bortek Industries. We’ll be happy to set up a repair visit for you. We’re always willing to listen and to work harder to exceed your expectations.